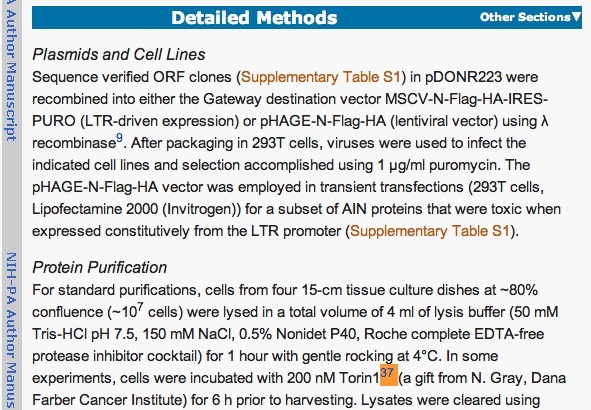 PubMed lists 804184 publications from 2009 with links to full text. Of these, 247421 (31%) have free full text, available for public view. Only a small subset, about 67000 (8% of all publications), are open access with full text that can be systematically downloaded and used for text mining. Now we want to see these articles within the PMC interface rather than the PubMed interface. To do this, have a look at the “Find related data” menu a bit lower down on the right. This will show the same articles but within the PMC interface. Or rather, it shows the first 10000 of the articles. That is how many of the 10000 articles are available as Open Access articles, as far as PubMed Central knows. of the articles are available as Open Access. Excellent. I knew you’d come up with a good method for assessing this. This is an awesome contribution. Thanks! Now we just need to get some *done* about this. 31% free vs 8% full Open Access is not cool. Should taxpayers start asking why ~75% (1 – 8/31) of the ‘free’ articles in PMC are not fully Open Access, and thus not as much value for money…? We’re already beyond the point at which it’s humanly possible to human-read all relevant scholarly articles. Machine-based text-mining use will surely only grow in future. Thus full Open Access will become more and more valuable… if people use it. Freely available just isn’t enough.